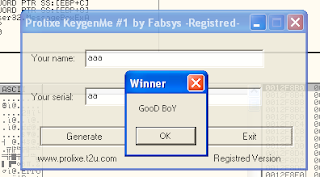 Open the keygenme and read the instructions (run binary) A MsgBox says "KeygenMe and delete this window good luck!!!" This is the most easy part, select from PUSH 40 to CALL and right click "Binary=> "Fill with NOPs"
Save in new file... click right button "Copy to executable" => "All modifications"
In the new Dump window click right button again "Save file" and save as "Keygen_cracked_step1.exe"
Try this new binary, enjoy without the on-start messagebox. 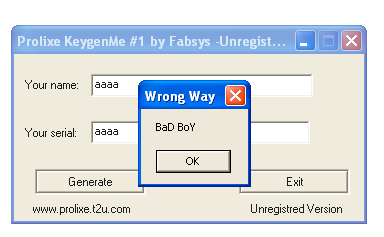 Run the program normally and set "Yout name:" and "Your serial:" with some garbage (typical aaaa is fine) and click on "Generate" you watch the "bad boy" in a MessageBox (like the one in the start) click on "Ok" to return to the main screen. Select the Prolixe keygenMe another time and click on "Generate" button again. Click on the button "Execute till return (Ctrl+F9)" in the main window toolbar. 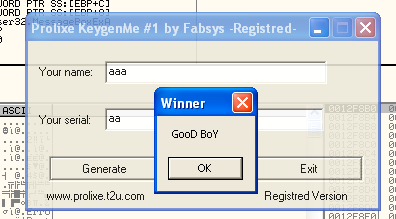 Switch to keyhen window and click on the "Ok" button of "badboy" messagebox, the olly stops again, in the last user32 instruction before return from stack to the main code again, click on "Step into(F7)" of main ollydbg iconbar. Now the CPU window is again in Keygen_c main module, after the call to MessageBoxA of user32.dll, with the "badboy" code in the top. Select the first instruction of MessageBoxA call, have a " => " on it. The last "PUSH 0" is the origin line, the other "JNZ SHORT Keygen_c.xxxx" is the "if" is the one who decides whether the serial is good or bad, do the same as the step1 right click and "Binary" => "Fill with NOPs"
Test the Button "Generate" of the Keygen again... a "godboy" messagebox appears. Save in new file... right click "Copy to executable" => "All modifications"
In the new Dump window right click again "Save file" and save as "Keygen_cracked.exe"